Since the beginning of the Industrial Revolution, when humans began burning coal in large quantities, the world’s ocean water has gradually become more acidic. 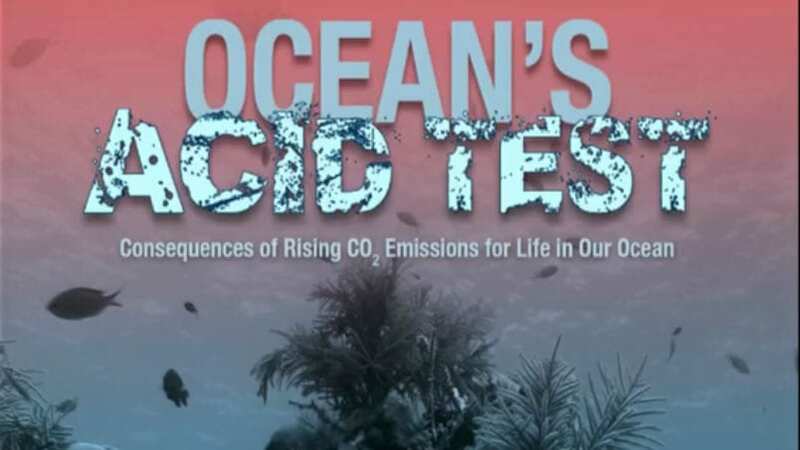 Like global warming, this phenomenon, which is known as ocean acidification, is a direct consequence of increasing levels of carbon dioxide (CO2) in Earth’s atmosphere. Prior to industrialization, the concentration of carbon dioxide in the atmosphere was 280 parts per million (ppm). With increased use of fossil fuels, that number is now approaching 400 ppm and the growth rate is accelerating. Scientists calculate that the ocean is currently absorbing about one quarter of the carbon dioxide that humans are emitting. When carbon dioxide combines with seawater, chemical reactions occur that reduce the seawater pH, hence the term ocean acidification. Currently, about half of the anthropogenic (human-caused) carbon dioxide in the ocean is found in the upper 400 meters (1,200 feet) of the water column, while the other half has penetrated into the lower thermocline and deep ocean. Density- and wind-driven circulation help mix the surface and deep waters in some high latitude and coastal regions, but for much of the open ocean, deep pH changes are expected to lag surface pH changes by a few centuries. Ocean acidification and global warming are different problems, but are closely linked because they share the same root cause—human emissions of carbon dioxide. The atmospheric concentration of carbon dioxide is now higher than it has been for the last 800,000 years and possibly higher than any time in the last 20 million years. Humans have thus far benefited from the ocean’s capacity to hold enormous amounts of carbon, including a large portion of this excess carbon dioxide. Had the ocean not absorbed such vast quantities of carbon dioxide, the atmospheric concentration would be even higher, and the environmental consequences of global warming (sea level rise, shifting weather patterns, more extreme weather events, etc.) and their associated socioeconomic impacts would likely be even more pronounced. However, the oceans cannot continue to absorb carbon dioxide at the current rate without undergoing significant changes in chemistry, biology, and ecosystem structure. Scientists know that the oceans are absorbing carbon dioxide and subsequently becoming more acidic from measurements made on seawater collected during research cruises, which provide wide spatial coverage over a short time period, and from automated ocean carbon measurements on stationary moorings, which provide long-term, high-resolution data from a single location. These records can be extended back through time using what are known as chemical proxies to provide an indirect measurement of seawater carbonate chemistry. A proxy is a measurement from a natural archive (ice cores, corals, tree rings, marine sediments, etc.) that is used to infer past environmental conditions. 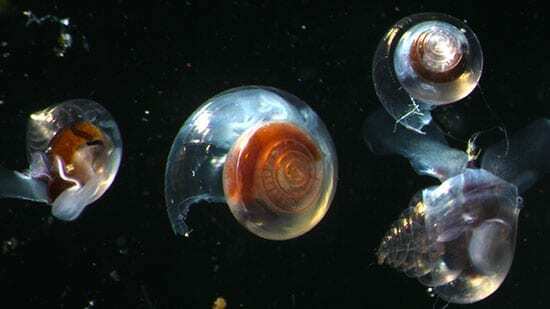 For example, by analyzing the chemical composition of tiny fossil shells found in deep ocean sediments, scientists have developed ocean pH records from ancient times when there were no pH meters. Furthermore, because the ocean surface water is in approximate chemical balance, or equilibrium, with the atmosphere above it, a record of historical ocean pH can be inferred from atmospheric carbon dioxide records derived from Greenland and Antarctic ice cores, which contain air bubbles from the ancient atmosphere. Such evidence indicates that current atmospheric carbon dioxideconcentrations and ocean pH levels are at unprecedented for at least the last 800,000 years. 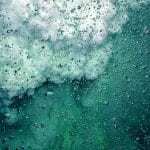 Going back deeper in Earth history to the Paleocene-Eocene boundary about 55 million years ago, scientists have found geochemical evidence of a massive release of carbon dioxide accompanied by substantial warming and dissolution of shallow carbonate sediments in the ocean. Although somewhat analogous to what we are observing today, this carbon dioxide release occurred over several thousand years, much more slowly than what we are witnessing today, thus providing time for the oceans partially to buffer the change. In the geologic record, during periods of rapid environmental change, species have acclimated, adapted or gone extinct. Corals have undergone large extinction events in the past (such the Permian extinction 250 million years ago), and new coral species evolved to take their place, but it took millions of years to recover previous levels of biodiversity. 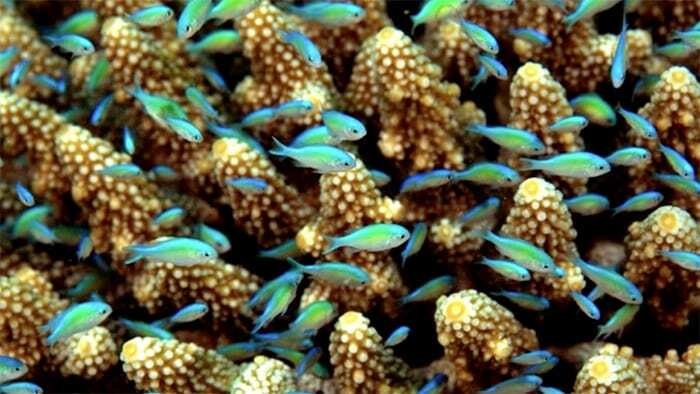 How is ocean acidification affecting ocean chemistry? Seawater has a pH of 8.2 on average because it contains naturally occurring alkaline ions that come primarily from weathering of continental rocks. When seawater absorbs carbon dioxide from the atmosphere, carbonic acid is produced (see Box 1), reducing the water’s pH. Since the dawn of industrialization, average surface ocean pH has decreased to about 8.1. Because the pH scale is logarithmic (a change of 1 pH unit represents a tenfold change in acidity), this change represents a 26 percent increase in acidity over roughly 250 years, a rate that is 100 times faster than anything the ocean and its inhabitants have experienced in tens of millions of years. Acidification can affect many marine organisms, but especially those that build their shells and skeletons from calcium carbonate, such as corals, oysters, clams, mussels, snails, and phytoplankton and zooplankton, the tiny plants and animals that form the base of the marine food web. 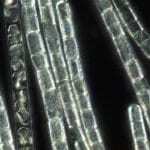 These “marine calcifiers” face two potential threats associated with ocean acidification: 1) Their shells and skeletons may dissolve more readily as ocean pH decreases and seawater becomes more corrosive; and 2) When CO2 dissolves in seawater, the water chemistry changes such that fewer carbonate ions, the primary building blocks for shells and skeletons, are available for uptake by marine organisms. Marine organisms that build shells or skeletons usually do so through an internal chemical process that converts bicarbonate to carbonate in order to form calcium carbonate. Exactly how ocean acidification slows calcification rates, or shell formation, is not yet fully understood, but several mechanisms are being studied. Most hypotheses focus on the additional energy an organism must expend to build and maintain its calcium carbonate shells and skeletons in an increasingly corrosive environment. In the face of this extra energy expenditure, exposure to additional environmental stressors (increasing ocean temperatures, decreasing oxygen availability, disease, loss of habitat, etc.) will likely compound the problem. These effects are already being documented in many marine organisms, particularly in tropical and deep-sea corals, which exhibit slower calcification rates under more acidic conditions. The impact on corals is of great concern because they produce massive calcium carbonate structures called reefs that provide habitat for many marine animals, including commercially important fish and shellfish species that use the reefs as nursery grounds. 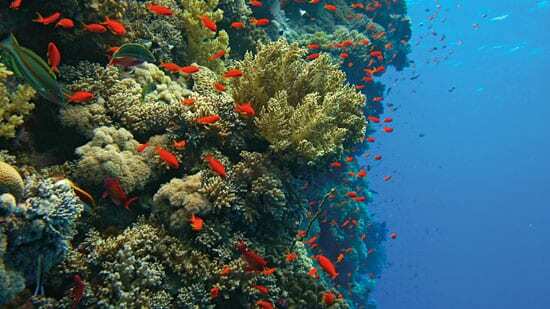 Coral reefs are vital to humans as sources of food and medicine, protection from storms, and the focus of eco-tourism. In addition to corals, studies have shown that acidification impairs the ability of some calcifying plankton, tiny floating plants and animals at the base of the food web, to build and maintain their shells. 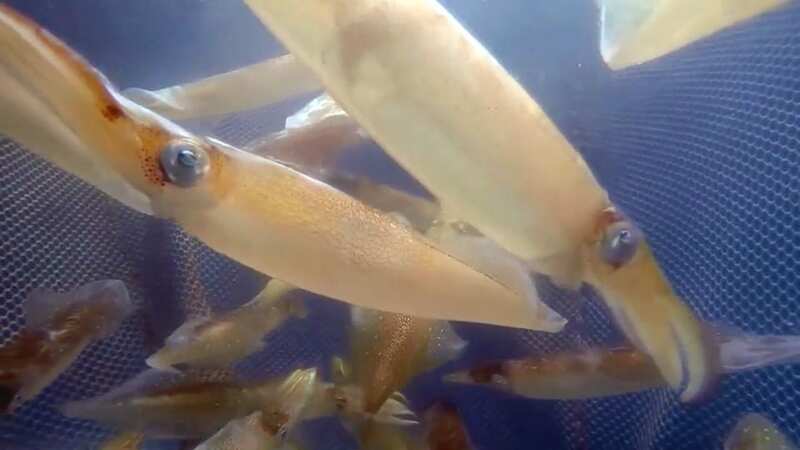 Scientists have also observed increased larval mortality rates of several commercially important fish and shellfish. Ocean acidification is occurring at a rate 30 to100 times faster than at any time during the last several million years driven by the rapid growth rate atmospheric CO2 that is almost unprecedented over geologic history. According to the Intergovernmental Panel on Climate Change (IPCC), economic and population scenarios predict that atmospheric CO2 levels could reach 500 ppm by 2050 and 800 ppm or more by the end of the century. 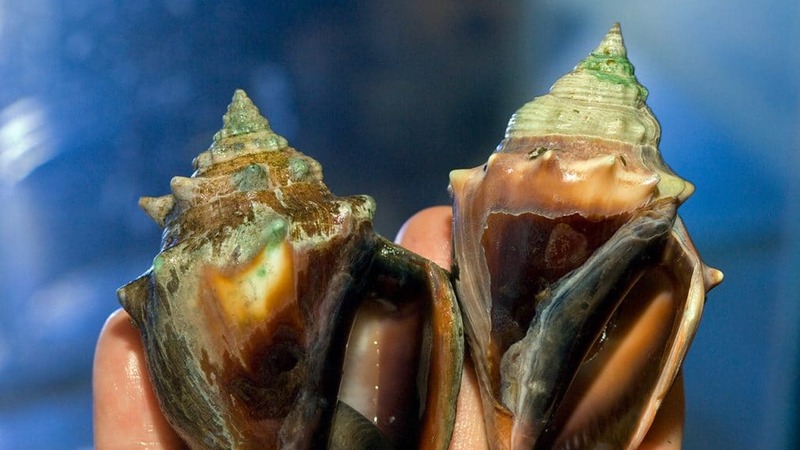 This will not only lead to significant temperature increases in the atmosphere and ocean, but will further acidify ocean water, reducing the pH an estimated 0.3 to 0.4 units by 2100, a 150 percent increase in acidity over preindustrial times. Assuming a “business-as-usual” IPCC CO2 emission scenario, predictive models of ocean biogeochemistry project that surface waters of the Arctic and Southern Oceans will become undersaturated with aragonite (a more soluble form of calcium carbonate) within a few decades, meaning that these waters will become highly corrosive to the shells and skeletons of aragonite-producing marine calcifiers like planktonic marine snails known as pteropods. Although ocean acidification has only recently emerged as a scientific issue, it has quickly raised serious concerns about the short-term impacts on marine organisms and the long-term health of the ocean. Scientists estimate that over the next few thousand years, 90 percent of anthropogenic CO2 emissions will be absorbed by the ocean. This may potentially affect biological and geochemical processes such as photosynthesis and nutrient cycling that are vital to marine ecosystems on which human society and many natural systems rely. At the same time, marine organisms will face the enormous challenge of adapting to ocean acidification, warming water, and declining subsurface-ocean oxygen concentrations. Graduate student Hannah Barkley is on a mission to investigate how warming ocean temperatures, ocean acidification, and other impacts of climate change are affecting corals in an effort to find ways to preserve these vital ocean resources. A new study led by WHOI scientists shows how changing ocean conditions can combine to intensify erosion of coral reefs. The Center for Ocean Solutions, supported by the Okeanos Foundation.